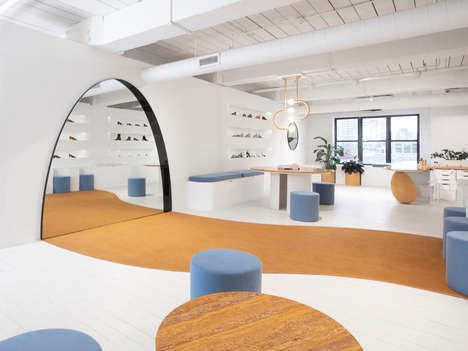 Luxe shoe brand Gray Matters is enjoying a brand new footwear showroom in Greenpoint, Brooklyn. Designed by local design studio Bower, the space spans 2,000 square feet and enjoys a minimalist aesthetic that is broken by vibrant inserts of colors and a slick arched mirror. This New York retail location is made to be appointment-only which is a definite nod to the luxurious and exclusive status of the Gray Matters brand. Bowler works with a mustard yellow and pale blue colorways that offer a slight nuanced juxtaposition. The lines of the footwear showroom are made smooth and dynamic, adding a smooth transitioning of shapes. Gray Matters’ shoe collection is stylishly presented on shelves that subtly fuse with the white wall, offering somewhat of an exhibition-like display of contemporary luxurious goods.